The number of empty shops blighting our high streets has trebled since the start of the credit crunch, it was revealed yesterday. A report shows 12.4 per cent of shops in town centres are empty, compared to 4 per cent in the summer of 2007. In some towns and cities a quarter of shops lie vacant as the recession has exacerbated the effect of other problems, such as rising rents and the growth of out-of-town shopping centres. Epitomising the trend is Victoria Street in Wolverhampton, with boarded-up shops apparently outnumbering those still open. The report, from retail research firm the Local Data Company, comes at the same time as shopping experts warned that the high street will never be the same again. The report names Margate, the seaside town in Kent, as the biggest casualty of the ‘ghost town’ crisis sweeping the country. A record 27.2 per cent of shops in the town are empty, which means over a quarter are lying abandoned, an eyesore for residents. In a row of 13 shopfronts over-looking the town’s beach, all but five have ceased to trade. In Wolverhampton 23.9 per cent of shops are vacant, putting it top of the table for closures in ‘large centres’. Dean Cooper, assistant manager of the Beacon Centre, a charity shop opposite the parade pictured above, said: ‘This street was all fashion shops before they started closing down – the area has been really badly hit by the recession. We are thinking of moving somewhere we can get more custom. Shops closing down has a real knock-on effect on those that are left. Matthew Hopkinson, from the Local Data Company, said the recession is not the main reason why there has been such a huge wave of closures in high streets. He blamed a toxic combination of ‘upward-only’ rent reviews, parking restrictions, soaring business rates and out-of-town developments taking customers from town centres. Another major reason is the internetretailing boom, with millions doing most of their shopping online. Chains which have collapsed in the downturn include Woolworths, book shop Borders, music store Zavvi and off-licence chain First Quench – which traded as Threshers and Wine Rack. Others, such as Blacks Leisure, are still trading, but 87 of its stores were closed at the end of last year. Companies continue to join the casualty list, despite the end of the recession, such as the Liverpool-based budget clothing chain Ethel Austin, which went into administration earlier this month. Many independent family businesses have also failed. There have been a few winners, such as discount retailer Poundland and the clothing chain Peacocks, which are both opening new stores. Liz Peace, chief executive of the British Property Federation, said: ‘The fact of the matter is that Brits now do a lot more shopping over the web. 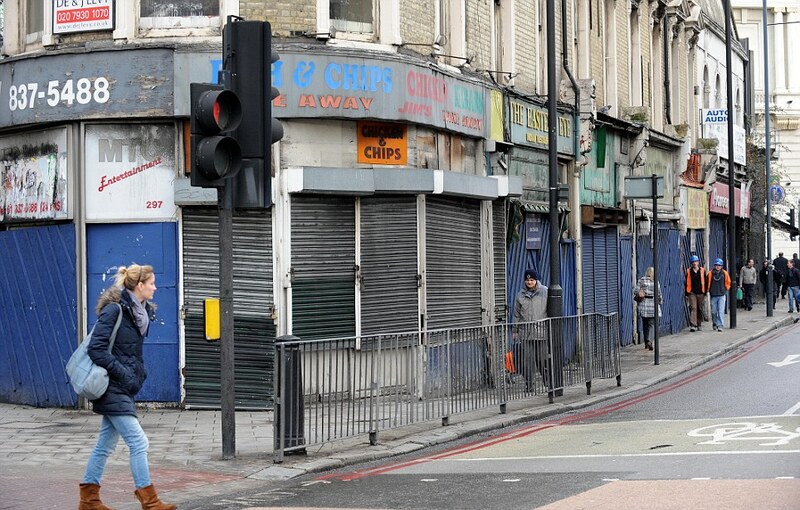 She is calling for councils to make it easier to convert shops to other uses, such as making them into homes. Stephen Robertson, director general of the British Retail Consortium, said: ‘Many of the problems of town centres have more fundamental causes than simply the economic slowdown,’ he added. The southern end of Victoria Street, Wolverhampton, pictured, was once a bustling fashion centre. It is now a sorry sight, a parade of boarded-up and abandoned 19th Century buildings.